If you are searching for a small Celtic accent with just the right amount of class, or Celtic buttons to add intricate detail to any look, you are in the right place. We offer a selection of Celtic buttons and cufflinks for the perfect touch of Celtic and medieval style no matter your outfit or occasion. 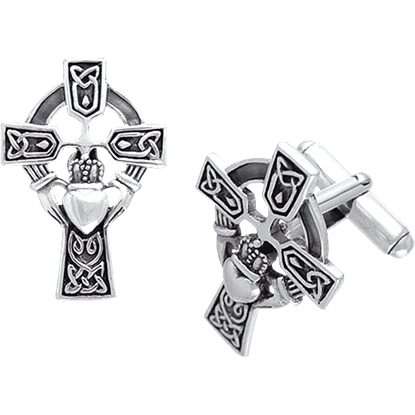 We offer Celtic cross and Claddagh heart cufflinks perfect for incorporating the iconic knotwork of Celtic culture into your special occasion wear. Celtic buttons are ideal for adding your own unique accent to a shirt you already own. Find all our Celtic cufflinks and Celtic button sets here, ideal for occasions that call for a subtle representation of Celtic style or for pulling out all the stops and incorporating Celtic style into any aspect of dress. Perfect for showing your devotion, the Celtic Cross Claddagh Cufflinks combine several traditional Irish symbols to form the stunning accessory. Wear these with formal attire or give them to a special someone as a gift. 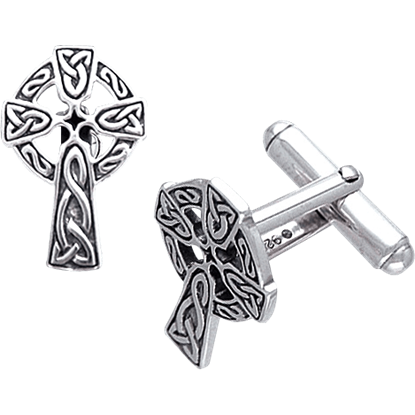 Though its origins are well-known, the Celtic cross, as seen in the Celtic Knotwork Cross Cufflinks, has varied and ambiguous meaning. Accepted as a blend of the Celtic and Christian cultures, it maintains universal appeal.